How Safe Are Theme Parks, Really? Millions of people flock to amusement parks for entertainment and thrills every year. These parks are what put Central Florida on the map. Visitors tend to assume that these parks are safe, but thousands of people are injured in theme parks every year. While accidents like slip-and-falls are pretty common, nothing quite makes headlines like an alligator ambush or waterslide decapitation. About six weeks ago, a toddler was attacked and killed by a gator at a Disney resort. The horrible accident served as a grim reminder that theme parks may not always be as safe as perceived. Now, the public has again been shocked by the decapitation of a ten-year-old boy at a Kansas City water park. The young boy, Caleb Schwab, was enjoying the day at the Schlitterbahn Water Park. Like thousands of others in line before him, he wanted to ride the Verrückt. Unfortunately, that ride would be his last. Check out the video below of the Verrückt’s first launch. You can easily see why one would figuratively have to be insane to ride that slide. Yet millions did — and without injury — until now. Although police are still investigating and few details have been released, we can piece together what happened on the tragic slide ride. Due to the great amount of force exerted by the speed and height of the slide, riders experience a form of negative gravity, whereby their bodies are lifted up out of their seats. Velcro straps are used as a safety precaution to allow riders to experience this thrilling sensation without actually flying out of the raft. In Caleb’s tragic instance, the Velcro straps must have failed, allowing his body to rise out and above the raft. At the bottom of the slide’s first slope, the raft enters an enclosed tunnel. Because Caleb was lifted too high into the air, his neck struck the top of the enclosure at a speed of 65 mph, resulting in the tragic injury. Safe-dangerous. It’s the term that Schlitterbahn co-owner, Jeff Henry, coined in describing the deadly waterslide after engineering challenges forced a redesign. “It’s a safe dangerous, now,” explained Henry. Something can’t be “safe-dangerous,” though. Like a car can’t be considered “fast-slow.” It’s one or the other. 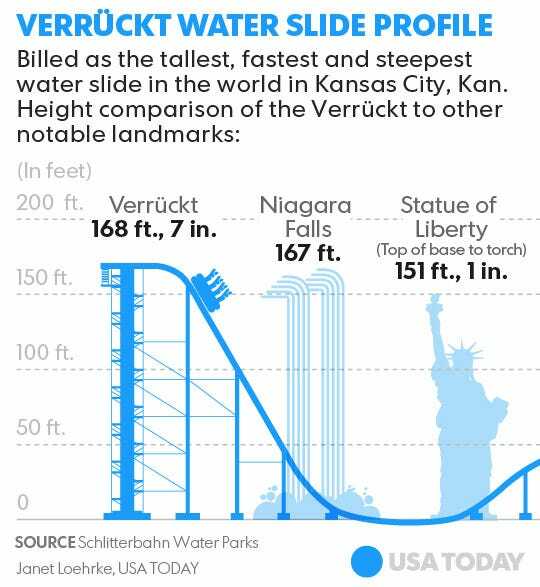 Just how dangerous is/was the Verrückt? Personal injury lawyers will either figure that out behind closed doors or make their arguments before a jury. No amount of dollars will fill the void and pain felt by Caleb’s family, but it is almost a certainty that the Park’s owners will pay millions for the accident. I personally love roller coasters. There’s nothing like experiencing the rush of a front row ride on the Hulk at Orlando’s Islands of Adventure or the Montu at Tampa’s Busch Gardens. I go to a Central Florida theme park about once a year to indulge. When those chains are clanking as the coaster makes its ascent, my insides sink. During that perilous trek up to the top of the world (“is it normal for the ride to make that strange clacking sound?”), the only thing that keeps me from wetting myself is KNOWING that nothing can go wrong and the ride is absolutely, 100% safe. Unfortunately, as Caleb’s recent tragedy has shown us, that presumption is incorrect. If you’re seeking thrills, trust your gut, not the theme park’s safety record or staff. There is always danger in that something can go wrong. If you believe you are experiencing a thrill without a risk, think again. If you or a loved-one has been injured in a theme park accident, you may be eligible for compensation. To understand your rights and determine whether you have a case, call a personal injury a lawyer. Our office in Melbourne, FL, offers free, no obligation consultations. Call (321) 222-0234 to setup a case evaluation with personal injury lawyer, John Collingsworth, today. http://collingsworthlaw.com/wp-content/uploads/2016/08/amusement-park-europa-park-boot-park.jpg 720 1280 John Collingsworth, Esq. http://collingsworthlaw.com/wp-content/uploads/2016/06/logo-optimized.png John Collingsworth, Esq.2016-08-09 13:48:192016-08-09 13:53:12How Safe Are Theme Parks, Really?